How do principles become timeless? When I discovered Strunk and White’s (1920) famous The Element of Style in school, it provided one of the best lessons in brevity I’ve experienced. I still keep it in mind whenever I’m asked to write, because its concise points are timeless––timeless in the sense that while it is about style, it is not binded to style. Strunk and White’s style guide is still incredibly in-touch with writers almost 100 years later. 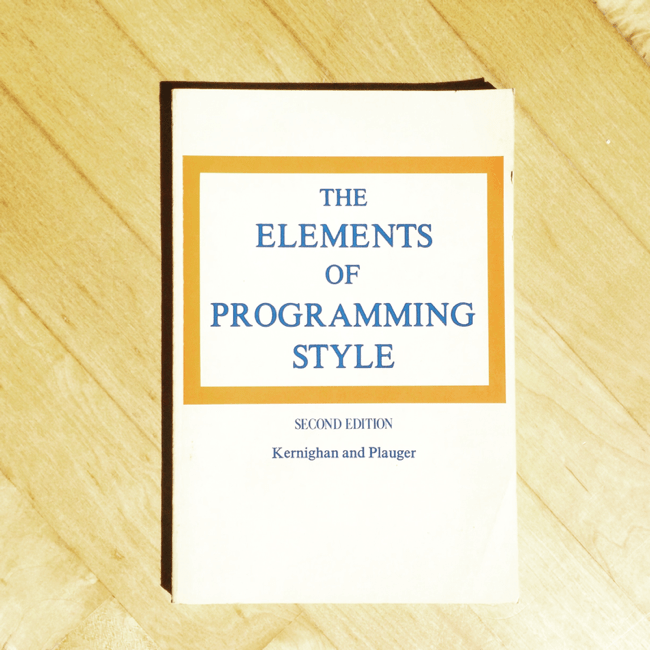 So I was happy to find this book, a derivative of the famous Strunk and White book, The Elements of Programming Style by Kernighan and Plauger, written in 1978, close to 40 years ago. TEPS uses Fortran as its example language, but much like the book that inspired it, the lessons it teaches are timeless and still hold up today. When you can distill rule and opinion to good practice, you can advice that lasts a longtime. I don’t think it’s quite right to call either the English, or programming style guide timeless, but it’s still evidence that core principles can last many decades, even if the software world feels like it’s evolving every hour. I took some time to summarize each chapter’s points, and as you can see most still apply to modern software development. Write clearly- don’t be too clever.